Check out some video from our concert at the "Masters of Rock Cafe." Wow. We have had an awesome week. God has been so faithful, and we have developed such a strong bond with the Czech believers. But now it's time to say goodbye. We are in Prague, heading out tomorrow morning from the airport. THANK YOU for all your prayers--we are all anxious to share with you about our week and what we've seen God do. Pray for safe travel back to Evansville! The Internet situation here isn't what we thought it was going to be, so I haven't been able to update the blog. Sorry! Thank you for your prayers--everything is going very well. We have had two great days of ministry in the park, and seen several people show interest and stop to talk with the Czech believers. It has been great to work in partnership with the Czech church. Tonight is our big concert at the rock cafe. Please pray for many people to come to that. I hope to get another update in before we head out. We're having a pre-trip concert tonight in the Mays' backyard on the West side. This will be a chance for us to play in front of an audience, and also a chance for the Mays to reach out to their neighborhood. The concert starts at 7pm at their house, which is at 328 Key West Dr. All are welcome to come. I will post pictures here afterwards. It's hard to believe, but we are now only one week from our departure date. We are in the final preparation phase now, focusing on packing and the last bit of rehearsal before we leave. Please pray for us during this time, that we can get adequate rest, time with our families, and not neglect our own spiritual preparation. 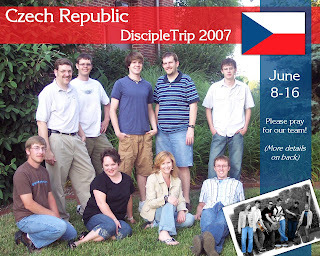 Also, pray for Barry DuBuque, from CFC, who will be traveling to the Czech Republic a few days before us. He will be over there for several weeks this summer, and will be a resource and logistics help for us during our trip. Continue to lift up the Czech church, as they are just as busy as us in their preparations. By name, please pray specifically for Samuel, Anna, and David. Pray for the city of Zlin--for open hearts, good weather for the concerts (almost all of them are outdoors), and for boldness for the Czech believers (and us) to share Christ. Thank you for your partnership with us! Great news! We have received 3 of the 4 remaining passports, and the fourth is in the mail and will hopefully be arriving today. Thanks to everyone for their prayers--God has answered and provided for us.